Roberto Paloma with reporter Andrew Atkinson. Crunch weekends are looming for a plethora of teams – starting at the weekend – in the Valencia 1st Regional Group 8 with games deemed worthy as ‘6 pointers’. With seven games to play CD Murada, leading the table, host 13th placed CD Altet, with a huge 29 points separating the teams. Racing San Miguel, who have slipped into third spot, will be keeping tabs on Murada’s Saturday fixture, ahead of hosting fourth place Santa Pola on Sunday, with five points separating Racing and Santa. 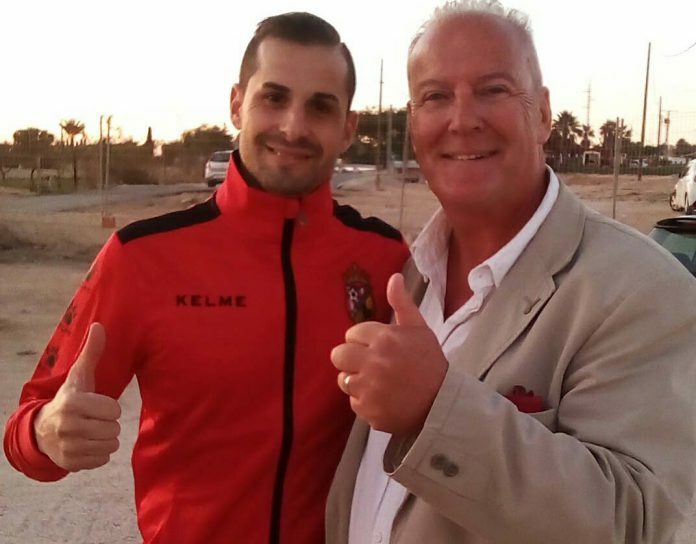 Second placed AC Torrellano, two points off Murada, travel to fifth placed Santa Pola CF on Saturday. Hondon Nieves, sitting sixth, host Atletico Catral, in ninth; Monovar, seventh, travel to 12th placed Rafal; with San Fulgencio, eighth, travelling to 14th placed club AD Betis. CD Montesinos, who have lost their last two games against Catral and Hondon, will be looking be bounce back to winning form at second bottom CD Dolores on Sunday, kick off 4.30pm. The Los Montesinos based club, in their second season in the 1st Regional, have had an indifferent campaign with coach Carlos Perez’s axing, added with injuries and suspensions blighting their ambitions. CD Montesinos’ lack of goals, 27 in 23 games, has been a cause for concern also adding to their woes, chalking up 23 points from 23 games. With CD Dolores conceding 49 goals this weekenk’s fixture is seen as an opportunity for Montesinos to grab three points. With Montesinos meeting AD Betis on March 24, the games against Dolores and Betis are deemed ‘six pointers’ – with games looming against Santa Pola CF, Racing San Miguel, and CD Murada, fifth, third and first placed, respectively. Montesinos midfielder Maccan, back from injury, is set to start at CD Dolores, with winger Roberto Paloma hopefully returning, after missing the 2-0 defeat against Hondon Nieves last week. Next articlePHIL’S PRESSING THE RIGHT BUTTONS! All Square:- Battling Monte share the spoils. Struggling Monte Fail to Finish. The Joy of Six: Monte Batter Betis. Desperate Dolores draw with “Half” Monte. Hondon (With A Little Help From A Friend!) Help Themselves to the Points. Monte Bottle It To Ten Man Catral. Early ‘Santa’ present for new Monte boss Ruben!